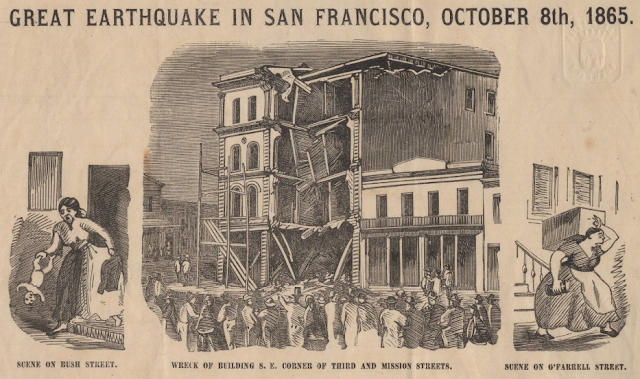 San Francisco was hit by two great earthquakes in the 1860s. Mark Twain witnessed the collapse of the building in the center image of this depiction of the 1865 quake. (Print by D.E. 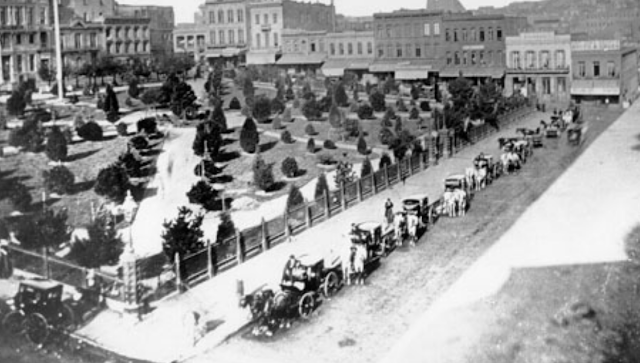 Appleton, Online Archive of California). Banished from Virginia City, unwelcome in Sacramento, Mike Brannigan crept back to his old haunts along the San Francisco waterfront. The city had grown a lot since he had been exiled by the Committee of Vigilance in 1856, and had become richer as well on account of the silver flowing in from the Sierras. Although the Vigilance Committee had been officially disbanded, it remained in power in the form of the People’s Party, which dominated San Francisco politics through most of the 1860s. While the People’s Party were less inclined to lynchings and paramilitary justice than the old Committee, they nevertheless continued to keep order with an iron fist, posting armed guards at polling places to discourage citizens from voting for the wrong party. All in the name of peace and justice, of course. Mike was not the first of the Vigilance-era exiles to return to the city. The trio of exiles who had seen him off from the New York docks on his first ill-fated attempt to return—“Dutch Charley” Duane, Billy Mulligan, and John Crowe—had each quietly slipped back into San Francisco over the intervening years. Although their banishments had been officially revoked, all of the exiles encountered trouble on their return to the city. Crowe had been set upon and beaten up by a group of men as a warning. Dutch Charley, the erstwhile fireman and politician, was now effectively blocked from both careers. He went into real estate, got into the occasional shoot out, and set himself to denouncing the Vigilantes in his angry memoirs. 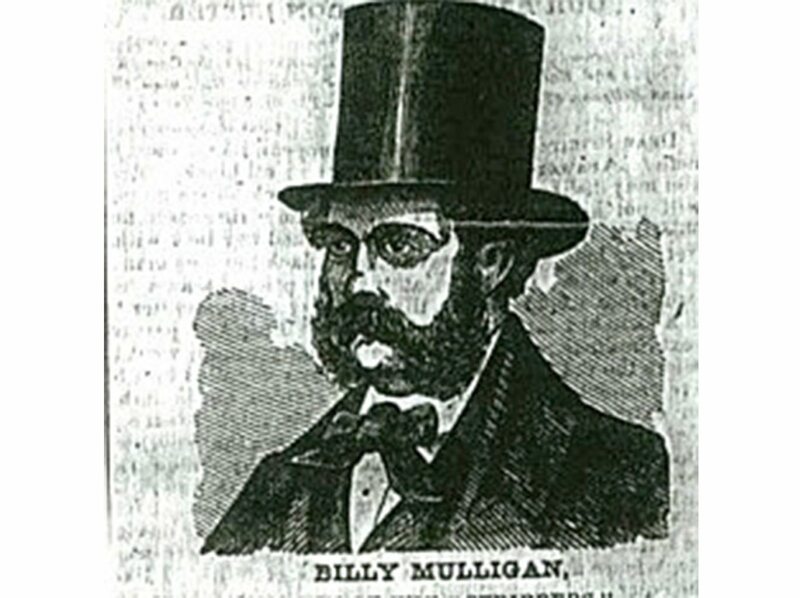 Billy Mulligan had it the worst. Billy had been a New York boxer back in the 40s, along with Duane, Chris Lilly, and Yankee Sullivan. He had fought in the Mexican-American war alongside Lilly, with whom he had also helped found the county of San Mateo as a gambling haven. During his exile he had made a visit to Sing Sing, which was suspiciously cut short, not unlike Mike Brannigan’s brief stay in San Quentin. Mulligan returned to San Francisco in 1863, and spent the rest of his life there drinking heavily and growing increasingly paranoid that the Vigilantes were out to get him. In 1865 he locked himself into a room at the old Saint Francis hotel on Grant and Clay, and started shooting out the window. In his insanity, he even shot a close friend who had come to talk sense into him. After several hours, the police finally brought Mulligan down with a hail of bullets. Mike was trying to avoid that kind of outcome. As quietly as possible, he went back to his old trade of hackdriving. The cab trade had also changed. In 1860, a group of drivers and livery stable owners had formed the Hackmen’s Association, to improve the public image of the city’s hack drivers. Johnny Crowe served as secretary. The association asked city officials to impose licensing requirements on the drivers of hired carriages, and to enforce the regulation of fares, in order to protect passengers from the bad apples who preyed on unsuspecting newcomers along the waterfront. The city complied with these requests, also requiring that hacks carry numbers (painted on the carriage lamps), and that drivers wear badges (pinned to their hats). 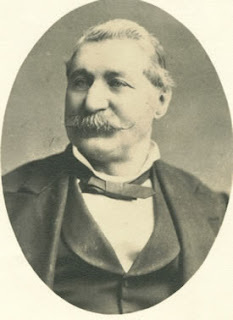 In 1866 the city appointed its first Hack Inspector, Bernard S. Blitz, reputedly one of Mark Twain’s drinking companions. Mike wasn’t the sort of cabdriver who supported this kind of regulation. Mike had more of a Travis-Kalanick-style philosophy—he resented having to get a license, and he practiced his own form of “surge pricing” every chance he got. He even was said to carry a blackjack so he could give uncooperative passengers some getting-hit-on-the-head lessons. Back in Mike’s time, his kind of driver was called a “nighthawk,” or a “scalper.” You can consider him the city’s first Uber driver. Mike’s first appearance in the news was for getting arrested for not having a hack license. His next appearance was for “using vulgar and obscene language” in the presence of a female passenger, who Mike claimed had refused to pay him for a ride. The fuller story came out during Gilbert’s subsequent trial. Brannigan and Gilbert had been at odds over the favors of a woman. The woman in question (who is never named in the news stories—the Alta describes her only as a “woman of the town”) apparently chose George over Mike, and moved in with him at his home at the corner of Clay and Pike (now Waverly Place). As we know, Mike never could take defeat well. After “following Gilbert for some time,” Mike showed up at his house and banged on the door, demanding to be let in. When Gilbert refused, Mike broke down the door and stormed into the room, throwing a large cobblestone at Gilbert’s head. Gilbert then pulled out a handgun and shot Brannigan in the arm, in self-defense. Lawful Game—At San Francisco, a few days ago, Mike Brannigan, the notorious, was shot by a man named Gilbert. Justice Barstow, after hearing the testimony, discharged the defendant, thus virtually deciding that Mike was lawful game for the shootists. Mike better go. In other words, “it is legal to shoot Mike Brannigan.” The public had no sympathy for Mike. Surely, people must have thought, it wouldn’t be long before Mike’s notorious career came to a swift and violent end.